Apple today announced a new 10.5-inch iPad Pro and a redesigned 12.9-inch iPad Pro at its WWDC keynote on Monday in San Jose, California. The new 10.5-inch iPad Pro has a 20 percent larger display, made possible by reducing the tablet's borders by 40 percent, yet it still weighs just 1 pound. It allows the display of a full size onscreen keyboard and enables users to attach a full size Smart Keyboard. Apple will offer the new Smart Keyboards in 30 more languages. Both new iPad models come with new displays, featuring True tone, wide color gamut, ultralow reflectivity, 600 nits brightness, and HDR video support. A new screen technology called ProMotion also brings dramatically improved display performance, doubling the display refresh rate to 120Hz, making for smother, more responsive content. It also works more accurately with the Apple Pencil, offering an industry-leading 20 milliseconds. A dynamically adjusting refresh rate also features on the new displays, which adjust depending on the content being viewed, with intelligent energy saving. 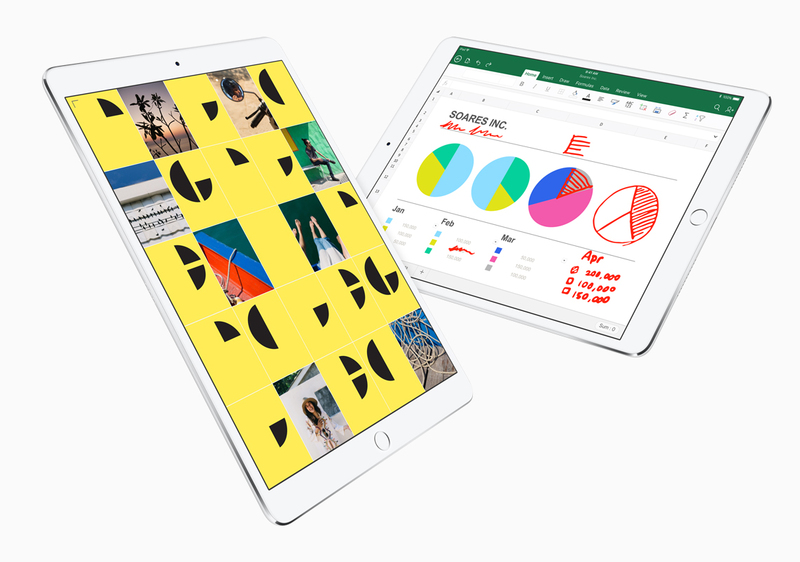 Apple says the new iPads have the same 10 hours of battery life. An A10X six-core Fusion CPU, with a twelve core GPU powers the new models, offering over 40 percent faster graphics performance. The 10.5-inch iPad Pro will start at $649 with 64GB storage and Wi-Fi only, and $779 for 64GB storage and cellular capabilities. The 12.9-inch iPad Pro starts at $799 for 64GB and Wi-Fi only, and $929 for 64GB with cellular. 256GB and 512GB storage capacities are available for both models, which all come in silver, space gray, gold and rose gold. Both tablets can be ordered today and are available next week. No Upate to 7.9 inch model? Tim's got to keep those margins up! Ordered my 256GB 10.5 in Black. Looking forward to selling my MacBook and going iOS only for my computing needs. 7 Plus and 10.5 Pro. I hope the 10.5" iPad has 4gb of ram and an updated Touch ID. As expected, no Mini Pro. Bummer. So how do you stop iPad lagging sales? Yes, you guessed it. By raising the price of course!! Good job Tim. Sure, 10.5" is a great update, but the real story is iOS 11 on iPad. I'm tempted to get one now, which is coming from someone who has had 4 iPads since the first one came out, but never loved them enough to keep using them. As a note-taking device with Apple Pencil and all those drag-and-drop and mark-up features I can see some real handy use for iPad in my workflow.